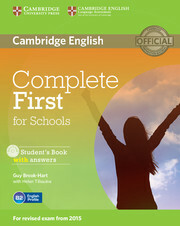 Complete First for Schools is official preparation for the Cambridge English: First (FCE) for Schools exam. It combines the very best in contemporary classroom practice with stimulating topics aimed at the teens age range. The course covers every part of the exam in detail, providing preparation, practice, information and advice to ensure that students are fully prepared for the exam. Informed by the Cambridge Learner Corpus, a unique database of exam candidate's answers, and providing an extra Cambridge English: First for Schools practice test, Complete First for Schools is the most thoroughly integrated exam preparation course available on the market. A full-length exam preparation course which integrates exam skills with language and skills development. The content is designed to appeal to the Cambridge English: First for Schools target age group to make studying for an exam enjoyable and motivating. Grammar and vocabulary exercises, informed by the Cambridge English Corpus, focus on the typical problems areas experienced by First students and offer practice to overcome them. A Cambridge English: First for Schools practice test is included online for teachers to access. The CD-ROM with the Student's Book allows further practice of grammar and vocabulary work that can either be used in class or by student at home. The Teacher's Book provides detailed teaching notes as well as photocopiable resources and progress tests. Get an eSample of Complete First for Schools that will allow you to view a product preview on your desktop.